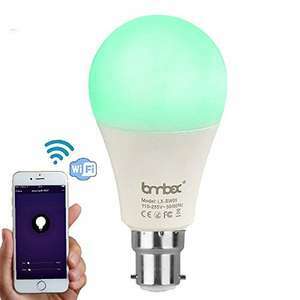 Lombex WiFi Led Light Bulb Smart Light Bulb B22 Bayonet 60W Equivalent Led Bulb Work With Alexa RGBW Color Changing Mood Light Controlled By Smart Devices No Hub Required For Relaxation Warm White [Energy Class A+]. Sold by Bepopcloud and Fulfilled by Amazon. **Voice control:Work with Alexa and Google Home perfectly to give voice command frees your hands. **WiFi Enable:Range is unlimited. Using smart App to control any Lombex smart things with connecting WiFi. **Efficient Management:Every Bulbs could be renamed for your convenient management. Pretty cheap considering it doesn't need a hub. Which do you go for please? Thanks, will be ordering some. Will give some of these a try, thanks op. Have you tried them yet? Any good? Haven't played with them yet, I'll let you know as soon as I do! does it have cool white color?